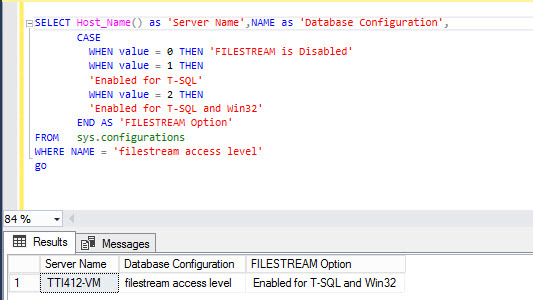 In my previous article, I described how to configure FILESTREAM in SQL Server, create FILESTREAM-enabled database and tables. Moreover, I demonstrated how to insert and delete data from the FILESTREAM table. In this article, I am going to demonstrate how to insert multiple files in a FILESTREAM table using T-SQL. In this demo, we are going to use the PowerShell module to populate the list of files and store it in the SQL table. Tools: PowerShell, SQL Server Management Studio, SQL Server Data Tools. In my previous article, I have created a database named FileStream_Demo. FILESTREAM feature is enabled On SQL Server instance, and the database has the T-SQL and Win32 access level permission. Create two SQL tables named, Document_List and Document_Content. The Document_Content table has the FileStreamCol column with the VARBINARY(MAX) data type and the FILESTREAM column attribute. The content of files within the directory will be converted in VARBINARY(MAX) and stored in the FileStreamCol column of the Document_Content table. Create a dynamic SQL query that iterates through the Document_Location table to get the path of files and insert files in the Document_Content tables. 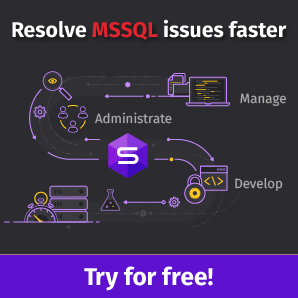 Wrap the entire T-SQL code in a stored procedure. Firstly, create a global temporary table to store the details of the files. For this, execute the following query in the FileStream_Demo database. Once the tables are created, execute the PowerShell script to insert details of files in the Document_List table. The PowerShell script runs within the T-SQL stored procedure, hence to write the entire code in the SQL procedure, you need to create a PowerShell function. The directory path is a mandatory input parameter of the function. The script gets the list of files, resides in the directory parameter used to execute the PowerShell function. Write-Output "File Inserted successfully... Below Is a list of files." To use the PowerShell function within the SQL Stored procedure, we need to register the above script as PowerShell Module. For this, create a directory named getFileList at C:\Windows\System32\WindowsPowerShell\v1.0\Modules. To register any PowerShell script as a module, the script and directory names should be the same. Hence save the above script asgetFileList.psm1 in the getFileList directory. Now, when we executed the PowerShell script from T-SQL, we need to import the getFileList module. For this, add the following code in the PowerShell profile. PowerShell profile will be created at the C:\Windows\System32\WindowsPowerShell\v1.0 location. If the profile does not exist, execute the following command to create a profile. Once we store the file list and information in SQL Table, we will insert the files into the Document_Content table. To do this task effectively, create a parameterized stored procedure named sp_Insert_Documents. It will use the FileLocation parameter that is of the varchar datatype. The procedure populates the list of files from the location given in the parameter and inserts all the files in the Document_Content table. Step 1: Change the configuration parameter. To run the PowerShell command using T-SQL, enable the xp_cmdshell configuration option. It is an advanced configuration option; hence before enabling xp_cmdshell, enable the Show advanced option configuration option. For this, execute the following T-SQL commands in sequence. To execute a PowerShell script using T-SQL, use the xp_cmdshell procedure. It executes the PowerShell command, which populates a list of files and its details in the Document_List table. Create a dynamic SQL query which iterates through the Document_List table, loads the content of the file, located at the path given in the FullName column, converts it into the VARBINAR(MAX) column and inserts it into the Document_Content table. Along with File, the script inserts File Name, File attribute, File Size, and File Type into the Document_Content table. The script uses the case expression to determine the file type. Create a parameterized stored procedure named sp_Insert_Files and wrap the code in it. To access the file on the FILESTREAM data store using Win32 API, use the Pathname () method of FILESTREAM. With the Pathname () method, we can identify the logical path to detect the file in the FILESTREAM data store uniquely. As you can see, all the files have been inserted in SQL tables and the FileStream container. Useful query to verify the pre-requisites of the FILESTREAM feature. How to register a PowerShell function as a module. Explain the PowerShell code to insert file list in SQL table using PowerShell script. Explained the code of stored procedure to insert multiple Files in SQL Table. Useful queries to gather a list of documents, stored in FILESTREAM container. In future articles, I am going to explain how to backup and restore FILESTREAM enabled database.